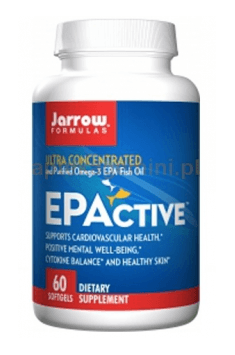 Jarrow Formulas EPActive is a dietary supplement containing eicosapentaenoic acid (EPA) from fish oil in the form of triglycerides. The recommended serving provides as much as 800 mg of EPA. The product meets USP purity standards - it does not contain heavy metals, dioxins or other environmental pollutants. The addition of a natural tocopherol mixture protects EPA against oxidation processes, guaranteeing the durability and stability of the formulation. EPA is a compound belonging to the polyunsaturated fatty acids of the omega-3 family. Supports the work of the cardiovascular system, supports the proper functioning of the nervous system and reduces inflammation and faster post-workout regeneration. Eicosapentaenoic acid (EPA) is, in addition to docosahexaenoic acid (DHA), the main compound belonging to the group of polyunsaturated fatty acids (omega-3 PUFAs), which mammalian organisms cannot synthesize due to the lack of appropriate enzymes. After entering the gastrointestinal tract, EPA is transported to the target cells where it’s converted to complexes with acyl-CoA, which can (after esterification to phospholipids) be incorporated into cell membranes. This way, EPA and other omega-3 PUFAs affect the properties of biological membranes. EPA can be released from phospholipids, becoming a precursor for the synthesis of eicosanoids. The composition of lipids in cell membranes has a large impact on the functioning of all cells in the body. In experimental studies, it was shown that due to the increased supply of omega-3 fatty acids, their share in cell membranes increases, replacing pro-inflammatory arachidonic acid (omega-6). It also causes changes in the cell membrane components - caveolaids and lipid rafts, lowering the cholesterol content at the expense of the growth of phospholipids containing EPA and DHA, e.g. fofatidylcholine in cardiomyocytes. Eicosanoids are a group of compounds that include prostaglandins, leukotrienes and thromboxanes, formed from polyunsaturated fatty acids. They regulate many processes, including inflammatory and clotting processes. By replacing arachidonic acid in cell membranes, EPA reduces the access of the pro-inflammatory eicosanoid component to cyclooxygenase-2 (COX-2) synthesis. In this situation, EPA becomes a substrate for COX-2, resulting in the formation of anti-inflammatory and anti-aggregating eicosanoids. Chronic inflammation is at the root of civilization diseases, e.g. atherosclerosis, therefore their reduction is an important goal of pro-health prophylaxis. As a result of intense physical effort, muscle fibres undergo micro damage, which results in an increase in the level of inflammatory markers. As a result, muscular pain and transient impaired muscular function are perceived. EPA, through its anti-inflammatory action, contributes to faster regeneration of muscle fibres. The products of EPA metabolism, reducing the synthesis of thromboxane A2, show antithrombotic activity, protecting against the formation of intravascular clots. In addition, EPA reduces blood triglyceride levels, which is a desirable phenomenon in the prevention and fight against metabolic syndrome, atherosclerosis and obesity. Polyunsaturated fatty acids make up as much as 20% of the dry weight of the brain. The ratio of omega-3 to omega-6 fatty acids has an important influence on the functioning of this organ. The increase in the level of pro-inflammatory omega-6 adversely affects the brain. According to studies, EPA, by affecting cell membranes and the synthesis of specific eicosanoids, improves blood flow, ensuring optimal access of brain cells to the necessary energy components. EPA can thus prevent the development of disorders, including depression and have a positive effect on brain and cognitive functions. To sum up, Jarrow Formulas EPActive is a safe dietary supplement recommended especially as an addition to a diet poor in fish, for athletes, people performing physical and mental work, as an auxiliary in metabolic syndrome and autoimmune diseases as well as an element of pro-health prophylaxis. Take 1 to 2 softgels per day with a meal, or as directed by your qualified healthcare professional. Fish oil is the best source of omega-3 PUFA since it contains "ready" active compounds - EPA and DHA, in contrast to the alpha linolenic acid (ALA) found in plant products (e.g. linseed). ALA has to be converted into EPA and DHA in the body, and the efficiency of this reaction may not be sufficient. For the best assimilation, it’s worth to supplement omega-3 PUFA with meals rich in fat. Jarrow Formulas is a manufacturer of dietary supplements, located in Los Angeles. They offer and sell theri products successfully around the world. The company's mission reflects the motto, which they take on a daily basis in their business, "Superior Nutrition and Formulation". Natural mixed tocopherols. Softgel consists of gelatin, glycerin and water. A complex of vitamins, minerals and plant extracts for men. It supports the proper functioning of the body. Inositol hexaphosphate. Supports the immune and cardiovascular system and has a hypocholesterolaemic effect. Vitamin C is an essentialt vitamin for humans, and the preparation AlphaSorb-C is the best source of it. A natural mastic resin that helps to maintain the health of the stomach, duodenum and the oral health. A dietary supplement that contains a powerful combination of vitamins, minerals and extracts. Calories are the conventional name of the unit expressing the energy value of food, the demand and energy expenditure in human body, which in fact is 1 kilocalorie (1 kcal). 1 kilocalorie is the amount of thermal energy required to heat 1 g of water and 1 degree Celsius. The SI unit of thermal energy is 1 joule (1J), equal to approximately 4,185 kcal. The energy value is determined by the chemical composition of the food product, by means of the so-called. physiological equivalents. Most often Atwater equivalent is used: ratio for protein 4 kcal / g, for carbohydrates 4kcal / g, and for fat - 9kcal / g.
The energy value carried out with the so-called. "Caloric bomb" is equivalent to the physical energy, amounting to 4.1 kcal per 1 g carbohydrate to 5.65 kcal per 1 g protein, 9.45 kcal per 1 g of fat. Nutritional value, determines the suitability of a food product for realizing life functions of human, the higher it is - the higher bioavailability and lower quantity for consumption for obtaining the effects. Total fats - total fat introduced into the body in food and dietary supplements containing both saturated fatty acids and unsaturated, including the essential fatty acids. Generally fats, thanks to energy production, allows for greater energy expenditure during exercise, causing post-workout regeneration. It is partially stored in the body. It is assumed that the energy of fat is 9 kcal per 1g. In addition to the production of fatty acids, they are the building blocks of cell membranes and the white matter of the brain. EFAs are precursors of tissue hormones and biologically active compounds. It is especially important to maintain a proper balance between acids of Omega 3 and Omega 6. Trans fats (trans fat) are the result of hydrogenation the liquid fraction of vegetable fat, by introducing the hydrogen bond of unsaturated fatty acid, forming trans isomers, causing the change of nutrient properties of fatty acids, by remaining only the energy source. They are used in hard margarine and food products (baked confectionery products). It is recommended to completely eliminate (or at least limit) the consumption of trans fats, because of their adverse effect on the human body (e.g. raise the level of total cholesterol, disturbed the balance between the factions of LDL and HDL, weaken the immunity of the organism and have a negative impact on the insulin metabolism, making it difficult to transport food into muscle cells, also there is noticed their influence on the development of cancer. Very rarely used in thermogenic sports supplements (i.e. energy bars). Fish oil is a source of long chain saturated fatty acids of the Omega-3 (EPA - eicosapentaenoic acid; DHA - docosahexaenoic acid), which are part of cell membranes and the precursor of eicosanoids, and an activator. When consuming acids Omega 3, it must be balanced with the Omega 6 (using in the range of from 1: 6 to 1: 1). Fats contained in fish oil help to reduce body fat, affect the oxygenation of the body, and the operation of systems: circulatory, respiratory, nervous system and the musculoskeletal system. Available in the form of mono-preparation supplement or as an ingredient of supplements in the category of "health and beauty". Omega-3 (n-3) group of unsaturated fatty acids: short-chain (linolenic acid, belongs to the EFAs [essential fatty acids]) and long-chain (eicosapentaenoic acid [EPA] and docosahexaenoic acid [DHA]). The number 3 indicates That the last double bond in the carbon chain is the third from the end of carbon. Acids from the group of Omega-3 are essential components of cell membranes, they are biological precursors and activators of eicosanoids. EFAs quite abundantly supplied in food, and it can be supplied with food. EPA and DHA (oils, fats marine fish) are Supplied by foods of sea origin (sea fish and seafood). They are developed also in the human body as a result of processes of denaturation and elongation of alpha-linolenic acid , but in an amount insufficient for the full needs of the organism. Therefore,they should be supplied from the outside. With the use of so-called. western diet, supplementation of fatty acids Omega 3 is more desirable (than Omega 6). Supplementation of fatty acids of Omega 3 is recommended for people who are physically active in order to supplement and to prevent deficiencies in body as well as due to their impact on the body composition and aerobic capacity, and tissue regeneration. In addition, it regulates the systems: circulatory (including heart), nervous, respiratory and locomotor. Formulations containing EPA and DHA are a complement to an effort diet, regardless of the degree of training and exercising. Dosage usually we recommended supplements in sports: depending on the supply of diet and intake of Omega 6 it is 1 - 5 g of EPA and DHA / 24 h.
EPA (eicosapentaenoic acid) – what is it? EPA (eicosapentaenoic acid) is a long-chain, polyunsaturated omega-3 fatty acid. The chain of the fatty acid consists of 20 carbon molecules, and the first bound out of five double bounds is located at the third carbon from the omega end, which is characteristic for omega-3 acids. It is present in large quantities in fish oils, where it is accompanied by docosahexaenoic acid (DHA). EPA is a precursor to prostaglandins and other eicosanoids, which contributes to the reduction in inflammations. It is involved in inhibition of platelets aggregation. It contributes also to the reduction in triglycerides level in blood. EPA block the activity of an enzyme, phospholipase A2, present on cell membranes, which under the influence of stressors can release polyunsaturated fatty acid (from the group of eicosanoids) into the glycerol skeleton. To some extent, EPA can be also converted into 22-carbon DHA. The both acids have positive impact on the condition of the nervous system and cardiovascular health. Fat loss – how to work out to avoid injuries? How to speed up metabolism? Tips for metabolism boost!